Do You Want to know about basic woodworking tools? Woodworking is a profession of art. To be a successful woodworker one needs to do finish the work step by step. If you are a beginner in woodworking, then how will you know the proper process of woodworking? The answer is by knowing the basic woodworking tools, you can understand about the woodworking process. The tools will show you a path to make the wood look as your need. On the other hand, there have many basic woodworking hand tools. But you don’t need all of them for different types of projects. Sometimes, one tool will offer you multiple hand work for woodworking. So there are some basic woodworking tools for the beginner you should know before starting woodworking. Circular saw: This tool is in the section on basic woodworking power tools. It is one of the most efficient woodworking tools without any question. You can cut the wood like plywood, wood sheet circular or cross with this saw. There are two types of a circular saw. They are Cordless and corded. The cordless circular saw will offer you to swap battery among the cordless circular saws. A common circular saw will cut less than 58 degrees and depth will be 2-9/16 inch. Choosing a circular saw for woodworking is a tricky work. There are some angles for choosing the tools. The weight of the tool, RPM of the blade, cordless- corded these will vary the price. Power jointer and thickness planner: You need to smooth the rough edge of a wood by using some manual hand tools. But an automatic power tool will make the work easy and accurate. For this work, I don’t see a better machine than power jointer. Initially, it smoothes the edge of a wood and makes the rough edge sharper. It is mostly used for finishing. This trimming machine is a time saver machine compared to handheld tools. This tool is ideal because it is lightweight and good for heavy as well as light wood projects. If you want to make furniture then this machine will be in the first few steps. Claw Hammer and screwdriver: A hammer will offer you to join two or more wood sheets with the help of a screwdriver. These tools will be needed repeatedly. Generally, an ideal hammer weight is 16 oz. Hammer handle must have to be vibration less while working. So the handle needs a good rubber grip. You can use many types of wood jointing screw according to your project. Chisel and mallet: Chisel is another finishing tool for woodworking process. It will offer you to clear the joints. You have to make sure a good medium handle with a rubber grip chisel as it will be pounded by a claw hammer and wooden mallet. Small chisel is used for groove work. For door hinges, ¾ inch to 1inch will the best chisel and for chipping out 1 ½ inch will be the best. If you need to cut the groove of a wood with the help of blow hammer then you should use the corner chisel. Mallet is one kind of hammer. It will be needed for pounding joints, fastening wood with a screw. You need to choose a medium-sized wooden mallet if you are a beginner. Framing square & measuring tape: Framing square is needed for measuring the wood accurately. This layout tool is set to measure angles with fractional increments on each side of the tool. Generally, 6″ and 12″ layout square are used by us. The triangle shape framing square will help you to mark square cuts on stock. You need to make sure that you will buy a metal framing square because the plastic one is fragile and they will warp easily. For accurate measuring, there is no substitute for measuring tape. You will need a retractable measure tape which will 25 feet long. You will need at least 1/8 inch variation in you measuring scale. Power drill: Another basic woodworking tool which is considered a powerful tool for woodworking. Generally, a drill machine is used for drilling any holes on a surface. For woodworking power drill also do the same job. A power drill will assist you to make a hole on wood and drive a screw through that hole easily with the help of a screwdriver. You have to select a lightweight power drill that can be corded or cordless. Basic hand saw: This is not a power tool. You will need this hand saw to wood layer-less and appropriate manner. Sometimes circular saw cannot cover the whole cut on a wood sheet. There you will need this basic hand tool. Sharpen hard teeth saw is always preferable for wood cutting. Router: This power tool is needed for complicated woodworking. Sometimes edges and shapes, as well as mortises, look way too complicated. Then this versatile tool will help you cut complicated areas. It is mostly an electric machine with or without a cord. The trigger will help to control the speed of the blade. For a beginner, it is a great tool. Toolbox: success rate in all types of works depends on how you manage to do the work. For woodworking, you will be needed many types of tools. These tools need to be arranged in a toolbox properly. These tools have security and safety issues. So a toolbox or container ensures the safety and security. For every work, you need to accurate to succeed. The tools will help you a lot to start woodworking properly. These basic tools have the variety of uses. This variation will show you the exact work that is needed to do on a wood sheet. 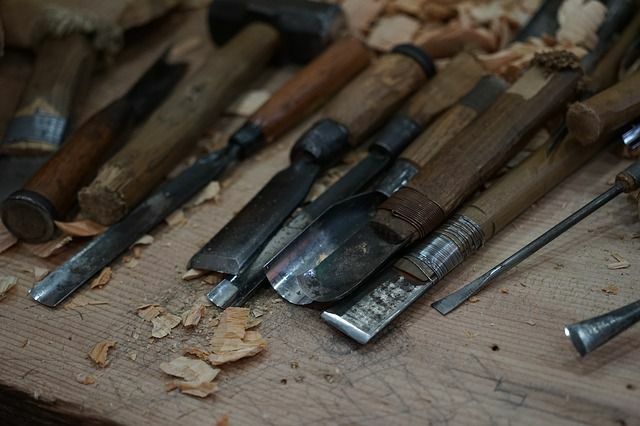 You can go through the Essential woodworking hand tools by Paul Sellers. This book has more detailed information about uses of basic woodworking tools getting started. If you are a new woodworker, take your time to know the tools. By using these tools continuously you will be an expert in woodworking.